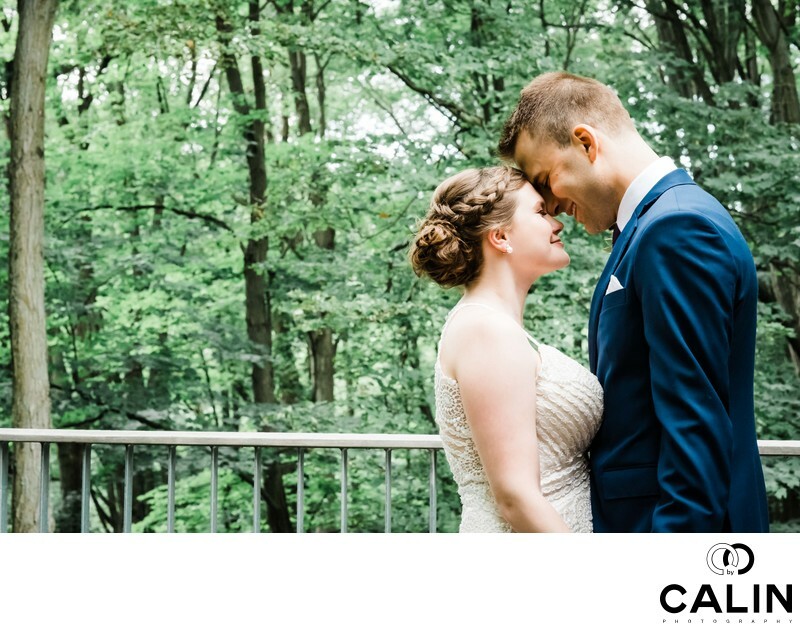 This Kortright Centre wedding album is infused with plenty of genuine emotions and this photograph is just an example. Starting with the growing preparation, I sensed that the bride and groom's families were not ashamed of expressing their emotions. The flower girls often embraced the groom and laughed freely. No matter how good a wedding photographer is, if his clients do not open up in front of the camera, the results will show it. The photographs will be a succession of poses without any soul in them if the clients are not comfortable in front of the artist. That is a reason why I screened my clients carefully to make sure there is a connection between me and the couple before committing to documenting their best day. I know plenty of Toronto wedding photographers who book any client disregarding completely the couples' style and preference and I think that is a recipe for disaster. Why so? First, the pictures will look cookie-cutter and cliché. Sure the light might be magnificent and depose perfect, but if there is no sparkle in the beautiful bride's eyes, the viewer can sense the fake. Second, if the clients are not comfortable with the photographer, they will not trust him and that poses serious challenges on the wedding day. Most of the time, my clients follow my directions without arguing, which saves me plenty of time, time I use to create beautiful pictures. Third, when there is a connection between the artist and the couple, the both work together as a team and the synergy of this partnership is apparent. In my career as a professional photographer I had to make tough decisions when I noticed that I wasn't a good fit for my clients. Especially of the beginning of the journey into wedding photography, when they needed every single penny I found it hard to forgo a client. However, in the long run, I believe I made the right decision. The clients whose special days I documented our know my friends and they send me referrals. Moreover, there siblings often approach me to photograph their big day. Fortunately, Kortright Centre for Conservation is a perfect location for romance. The beautiful forest, the winding pathways and the birds chirping give the place an aura of love and happiness. As such, it is just normal for couples to feel in love here. While the venue is not one of the most luxurious locations in the greater Toronto area, it is the perfect spot for the echo conscious couples. The establishment is a nonprofit organization governed by TRCA. This conservation area is not only popular for couples want to get married here but also for engagement sessions. According to a research, this is one of the most unique locations in the GTA. Among its attractions, we would like to mention the sugar bush maple syrup festival, the kite festival and so on. While those are excellent attractions for the family and guests, the might also constitute distractions and caused delays during the photo shoot. I shot quite a few times at this location and the best tip I can give a bride is to wear a pair of running shoes so that she doesn't win her beautiful Louboutins.